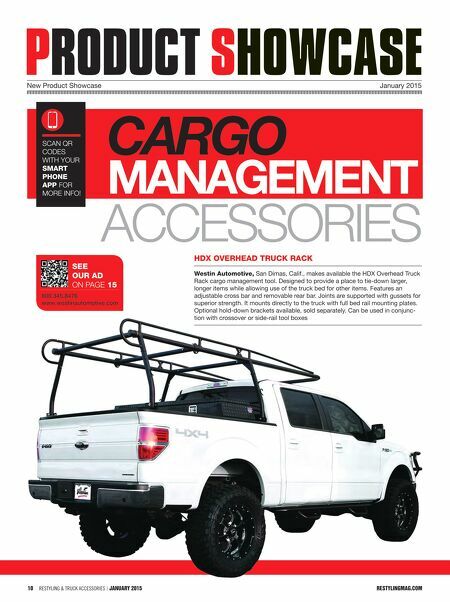 restylingmag.com January 2015 | Restyling & tRuck AccessoRies 11 Check out more products at restylingmag.com/product-connection Ample storage space is valued by all vehicle owners but especially parents, sportsmen, and work truck drivers. 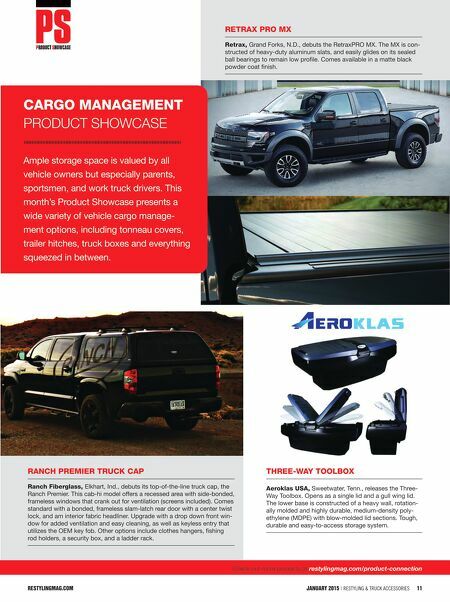 This month's Product Showcase presents a wide variety of vehicle cargo manage- ment options, including tonneau covers, trailer hitches, truck boxes and everything squeezed in between. CARGO MANAGEMENT PRODUCT SHOWCASE RANCh pREMiER TRuCk CAp Ranch Fiberglass, Elkhart, Ind., debuts its top-of-the-line truck cap, the Ranch Premier. This cab-hi model offers a recessed area with side-bonded, frameless windows that crank out for ventilation (screens included). Comes standard with a bonded, frameless slam-latch rear door with a center twist lock, and am interior fabric headliner. Upgrade with a drop down front win- dow for added ventilation and easy cleaning, as well as keyless entry that utilizes the OEM key fob. Other options include clothes hangers, fishing rod holders, a security box, and a ladder rack. RETRAx pRO Mx Retrax, Grand Forks, N.D., debuts the RetraxPRO MX. The MX is con- structed of heavy-duty aluminum slats, and easily glides on its sealed ball bearings to remain low profile. Comes available in a matte black powder coat finish. ThREE-wAy TOOlbOx Aeroklas uSA, Sweetwater, Tenn., releases the Three- Way Toolbox. Opens as a single lid and a gull wing lid. The lower base is constructed of a heavy wall, rotation- ally molded and highly durable, medium-density poly- ethylene (MDPE) with blow-molded lid sections. Tough, durable and easy-to-access storage system.